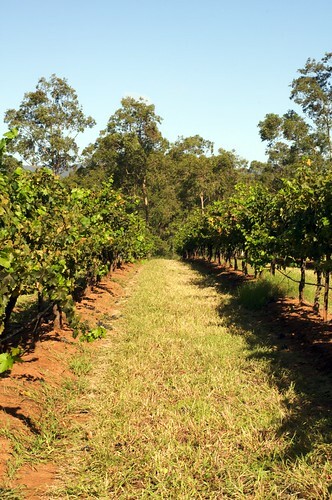 Should I ever sit down one day and start writing my bucket list, somewhere on that list will be the line item “stomping grapes in a vineyard”. Happily thanks to a trip down to the Hunters on Sunday, I can now cross that hypothetical item. 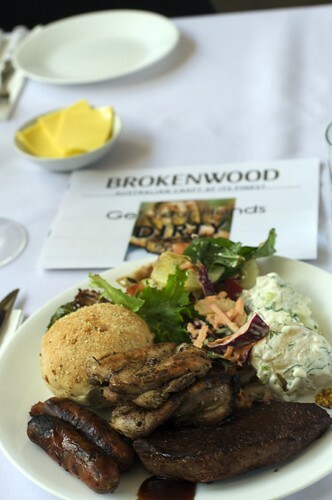 Late last year I joined Brokenwood’s wine club and one of the many benefits is an invitation to their annual “Get Your Hands Dirty Lunch”. 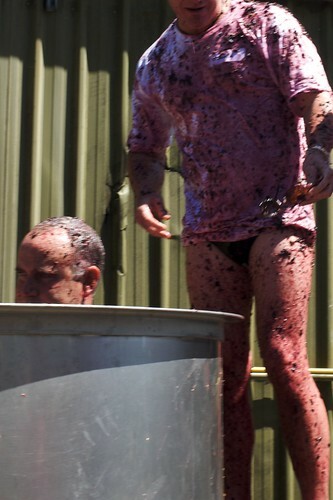 I invited Rz to come along for the fun and although it meant that we will need to be awake before dawn, it somehow felt like a small price to pay for the promise of swimming in grapes. Sunday morning came and by a fluke or a miracle, the sun was out, but temperature did not reach the crazy limits of a typical February summer. The moment we arrived, we were put to work immediately. 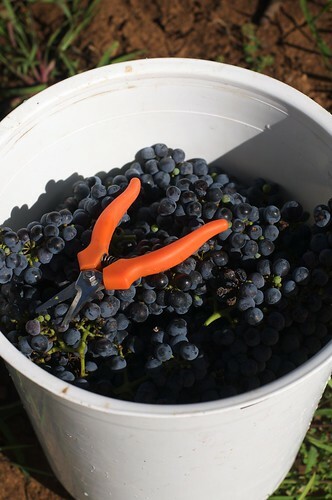 Bucket with one hand and shears in the other, it felt a little surreal snapping away at the blue berry like grapes. For once my height (or lack of it) prove to be a blessing as the vines are within my eye level, making us as Rz noted “grape height”. Post picking we wandered around the vineyard, sampling wines at different stages of fermentation. 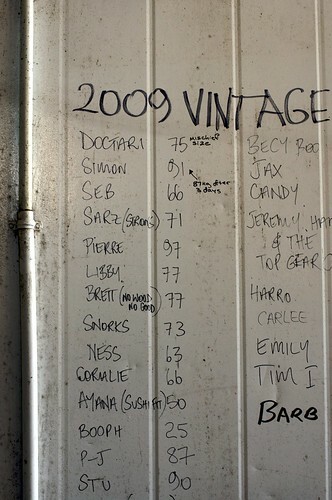 In a number of their Semillon their semi fermented state was a cross between grape juice and lemonade. One thing that did struck me throughout the tour was how homely the entire place felt. 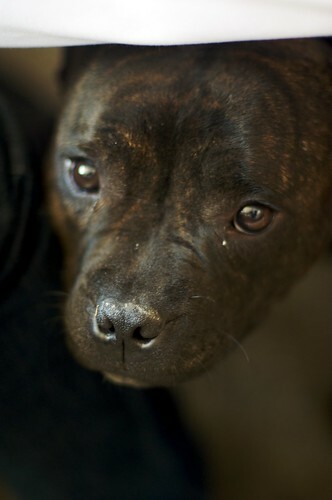 A board with the (professional) picker’s tally was clearly visible, a ping pong table was placed in the middle of the warehouse (strangely not at odd with the french wine barrels along the walls) and the fattest, friendliest staffy was wandering around looking for a pat and a cuddle. 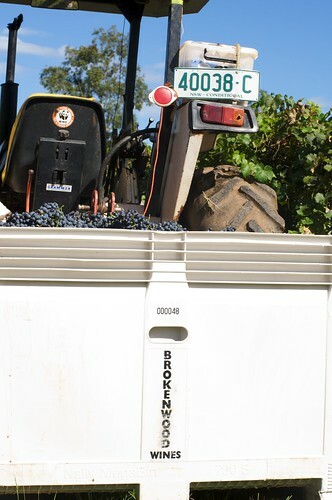 Once the tour was over, we were handed a white t-shirt and ushered towards the two big wine vats containing the day’s pickings. As excited as I was, it dawned on me that a few extra inches would help to get in and out of the vats! Falling in was easy, but without the help of a milk crate there was not a chance in hell that we can climb out without an extra hand or two. I don’t have any photos of being inside the vat as my camera would have died a very quick and purple death. I can however say that the experience was nothing like what I thought it would be. 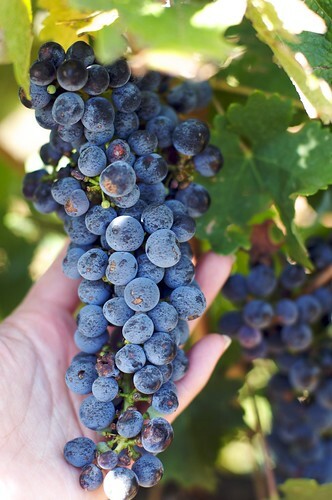 The grapes were squishy and burst on impact. I could not stop giggling once my brain caught up with the fact that I was waist deep in very cold grape juice while grape missiles were thrown overhead. 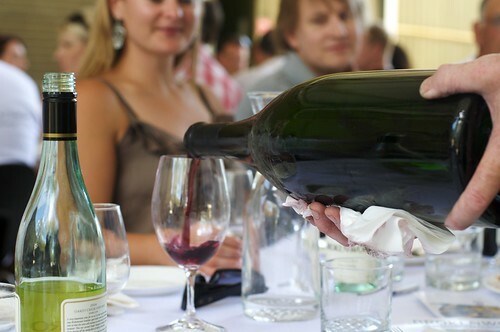 After being hosed down and finding bits of grapes in the most unlikeliest places, we sat down along two long tables and the wine kept appearing…. 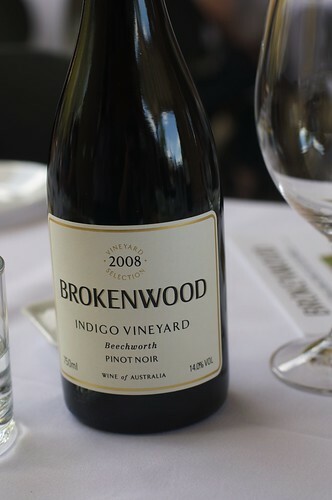 The first Brokenwood wine I ever drank was their 2008 Pinot Noir (Beechworth), an easy drinking Pinot with enough character to make it interesting. Turned out their Semillion were not too bad and I am rather partial to their shiraz in general. He was adorable, would happily dog nap him if I could. This would have been on my bucket list for sure! Were you stained purple for a few days after? Surprisingly not, but I found bits of grapes in a lot of places I did not expect.